When we use our Android smartphone, many of us have noticed that sometimes we find a notification of Android System WebView. At the notification, you will see that it updates itself. Well, most of us ignore it. But, have you ever wondered that what is that Android System WebView which is updating itself on my Android phone? Obviously, not because we don’t care about it. However, most of us stop that update from being done. This is what we are not supposed to do. Yes, you are listening right. Why you should not do so and what exactly Android System WebView is? We will find in this article. Android System WebView is a system component which is powered by Chrome. The Android System WebView allows Android apps to display in-app web content. To ensure that your Android phone correctly uses the Android System WebView you should keep updating it regularly, or you can use auto-update feature to do so. To understand it better let us take an example for that. We all use Facebook app. In the Facebook app, you have noticed that when you click on a link from the news feed, you find that the web page opens in the Facebook app. When you click on the back button, it will revert you to the news feed again. Am I right guys? When the Android System WebView was not available in Android smartphones. Then, the user has to leave the Facebook app (you can consider any other app also) and opens the link in a web browser once the job is done. The user closes the web browser and navigates to the Facebook app again. This was too long for an Android user. This procedure takes so much time to complete a simple task. So, Google created the Android System WebView app for ease of use. An Android user can easily download the Android System WebView app LINK directly from the Google Play Store for free of cost. However, from Android version 4.4 and up you don’t have to download it manually. Why? Because the app comes as a pre-installed app by Google in the Android operating system. The only thing which you need to do regarding this app is that make sure you keep updating this app so that the vulnerabilities will be fixed as soon as possible. Maybe you do not find the app useful, or you have your own opinion regarding the app then don’t panic. You can easily disable the Android System WebView app from your Android smartphone. I want to tell you one more thing that you can not uninstall the Android System WebView app from your Android phone. However, you can uninstall that app updates which has been done from past days. To disable it, navigate to the pane: Settings > Manage Apps > Android System WebView > Force Stop/Disable. That’s is this is how you have to disable the app. Similar to that if you wish to have the complete details about what is Android Pay then do read this article. 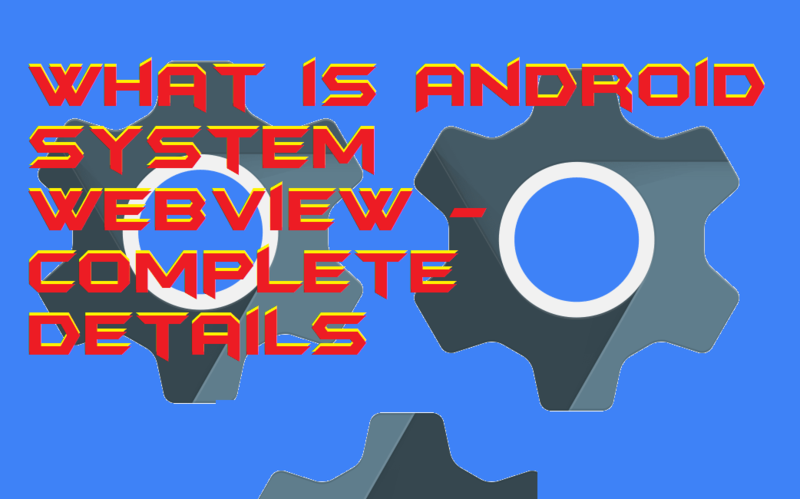 This was the complete details regarding Android System WebView. Not only the details of it but we have also found that how we have to install it and how it works. If you liked my explanation of the Android WebView, then have some knowledge of the advantages and disadvantages of Android Once and Android Go. I hope now I have solved you all queries regarding this app and you have got the complete details about the Android System WebView. You can share this article with your friends and family members so that they can also have some knowledge of the same.